Except for one day, our French vacation was all about touring Paris. Toward the end of our trip, we took a bus trip to the Brittany coast to view the famous island/fortress/church of Mont St. Michel, or “the Mountain of Saint Michael” for us Anglophiles. If you do not know who Saint Michael is, apparently in Catholic theology angels can also be saints. In this case, Saint Michael is none other than the Archangel Michael. The mountain is actually a small island that sits just off the northern coast of France, where Brittany and Normandy join. As mountains go, it is more of a molehill, with rock faces pushing up a few hundred feet above the English Channel. For most of its history, it truly was an island. Lately tidal forces have largely taken away its island status. Silt and sand have effectively joined it to the continent. This is a development alarming enough to the natives that there is a large restoration project underway. This effort is trying to reverse the course of nature. If it succeeds, Mont St. Michel will become a proper island again. It is still impressive, both as an island and as a religious destination. It is also a long day trip from Paris. We had to rise before six in the morning in order to make our way to downtown Paris to meet our tour bus at the Cityrama Offices. 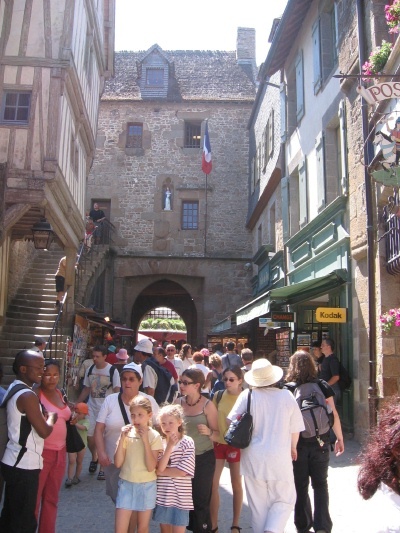 In order to make the trip to Mont St. Michel in one day, our time at the island was necessarily short: a few hours. It took six hours on an extremely comfortable tour bus with about seventy other tourists to get to the mountain. By this time in our vacation, we were glad to escape Paris. Our dawgs were tired after a week of touring. It was nice to spend most of the day relaxing in an air-conditioned bus and watch the French countryside pass us by. On the trip to the island, our bus took the back roads. This gave us a taste of the French countryside that was very welcome. Cloistered farms account for virtually all of the available countryside. There are no primordial forests left in that part of France, but there are numerous small French towns populated with small stone buildings that look like they have been around hundreds of years. The French are if nothing else a tidy people. Their yards are small and well maintained and their towns clean and attractive to the eye. At the center of each small town was a traffic circle. We stopped in one small town whose name I did not capture for a hotel brunch. We were fed well with a quality selection of pastries, eggs, meats and fruits. Not all of us had English as our native language, which meant there was little conversation with others on the tour. Two interpreters were brought for the trip: one who spoke French, English, Spanish and Italian, and another one just to translate for a large number of Chinese. Our bus was very big and very long, so I was amazed that it was able to negotiate some of the hairpin turns. In some cases, it had to block traffic coming in the other direction in order to make the turn. Eventually we descended into the Normandy coast and caught Mont. St. Michel in the distance. Until we arrived at Mont. St. Michel, Notre Dame seemed ancient. 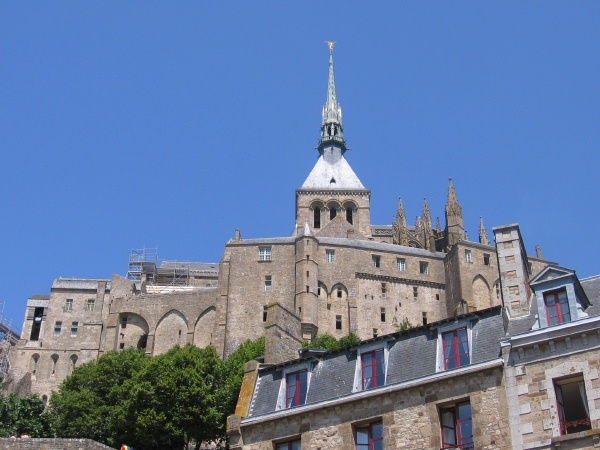 I learned that Mont St. Michel’s modern history began in 6th century as an Amorican stronghold. It first became associated with Christianity in the 8th century with the construction of a monastery called Mont Tomb. The island turned out to be strategically valuable. With its large rock-facing cliffs, it was easily defensible. Consequently, it was not too long before it became a combination monastery, fort and church. The island is not for the vertically challenged. Do not expect special accommodations for the handicapped. Prepare to climb. Fortunately, the climb was rather predictable and not too onerous. In some ways, it reminded me of Minas Tirith, the mythical city created by JRR Tolkien for his Lord of the Rings Trilogy. Maybe he was inspired by Mont St. Michel. As with Minas Tirith, on this mountain the higher you were the more elevated the status. At the top was the church itself, which was plain by the standards of Paris. However, the church was not designed to be ornate. It was a church designed for a monastery. The clerics and civic officials inhabited the next level. Further down lived the merchants and the citizenry. For a time the monks abandoned the mountain and it was transformed into a prison. 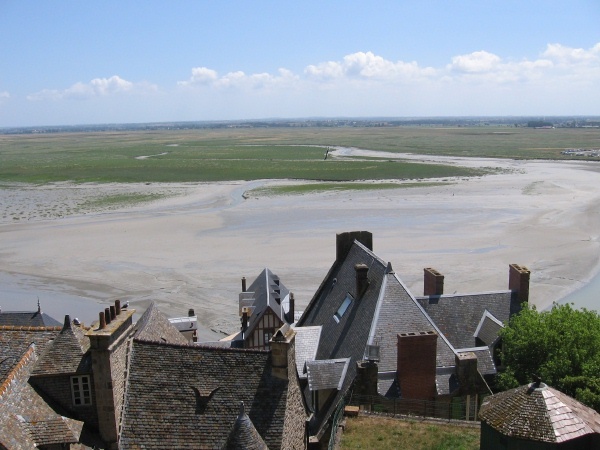 By the 19th century, in part due to an initiative by the French writer Victor Hugo, the Mont St. Michel the prison was closed and the mountain was transformed into its latest incarnation: tourist attraction. In that sense, it is wildly successful. The tour buses and cars extended for a mile or more into the mainland. There were many places on the island to buy souvenirs, meals or ice cream. Yet still the island feels remote. Even in the middle of the summer rush on a beautiful day, it felt cool and windy. Perhaps the island loses much of its charm during the other seasons. It offers an unparalleled view of the coasts of Brittany and Normandy. Nearby is another smaller island, which was used as a convenient quarry for constructing the fortress. The English Channel in its immensity is to the north. Somewhere across that wide blue expanse is York. We had about three hours to spend on Mont St. Michel. We followed our tour guide, and then bought a few souvenirs and some ice creams before heading back. We returned to Paris via a different route that took us along interstate quality toll roads. We stopped at a D-Day museum in the city of Caen for dinner. If Paris is ancient, Caen felt very modern. If I had to live in France, Caen would be a logical choice because it felt so comfortably modern, prosperous and clean. We did not return to downtown Paris until around 10 p.m., which made for a very long day. On our last day in Paris, we had planned tours of Versailles and Chartres. Our Versailles tour was canceled the day before. However, we were able to take a RER train out there in the morning and see it anyhow, although our visit was rushed. We had to hurry back to Paris to catch the bus for our Chartres tour. Unfortunately, we beat our way back to Paris to discover that Travel Bound, the agency AAA contracted with for our tour, had screwed up. They subcontracted the tour to CityRama. Travel Bound they told us they offered the tour on Thursdays, even though our reservations showed confirmations for a Thursday tour. Instead, we hung around the fair grounds for a while, and then returned to our hotel to pack: we would fly back the next day. Thankfully, our trip back to the States was uneventful. Our flight left Paris on time, which was good because Iceland Air only makes one trip a day to Paris. Our connecting flight in Iceland to Baltimore was delayed about an hour, but we made up some of the time on the flight back. We found the customs process returning to the United States more than a bit xenophobic. There were no less than four separate processes that jet lagged tourists have to navigate. My sister Mary picked us up at the airport, and we chose to drive home to Northern Virginia, arriving home around 10:30 PM. It made for a very long day. By the time I stumbled into a foggy sleep in my own bed, the sun was rising in Paris. Overall, it was a good vacation. Despite the slipup with the tour, I did not feel cheated. I hope I can explore Paris in a more leisurely fashion some other time, perhaps when I am retired. We just scratched its surface. There is so much to admire about France and Paris in particular. My expectations were modest before the vacation. I got far more from Paris than I expected. I think the French deserve to be proud of their country and their culture. It is an enlightened country. Occam’s Razor will now return to more traditional content. Here is a snapshot of some of the other places we visited recently during our vacation in Paris. 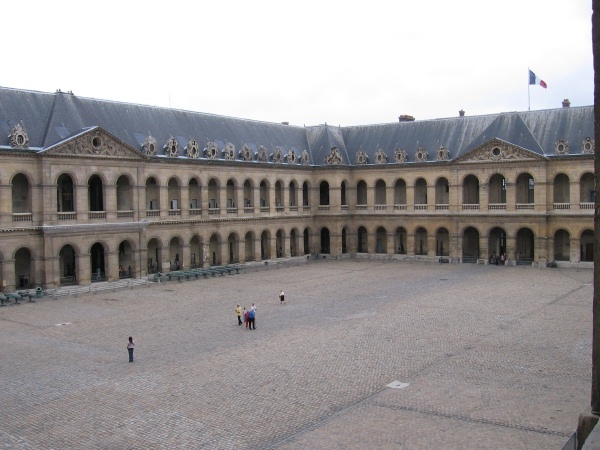 The first museum we visited in Paris, on a grey Friday morning, was The Hotel Des Invalides. It was never really a hotel, but was instead built to be a home for disabled French soldiers. The “hotel” is grandiose in size. It feels almost as big as The Louvre, just not as well maintained. Today it is a French military museum, with some wings hosting exhibits and some left empty. The exhibit I most wanted to see (the one with the medieval catapults) unfortunately was closed for renovation. If you are into suits of armors (many worn by nobility), pikes, endless variations of swords and lethal cutlery collected in Europe over many centuries then this is your museum. Cannons must have been as common with weeds hundreds of years ago, for Invalides is overrun with them. Many of them are stood up on their sides and ornately engraved. Of more interest to us were the buildings attached to and near the museum. These included a church, the Eglise du Dome, the first of many we would visit. Its dome and altar seemed very impressive at the start of our vacation. The sound of a soloist rehearsing in front of the enormous pipe organ in the back of the church added an unnecessary feeling of reverence. Yet compared to the other churches we would later visit, it was rather unspectacular. In contrast to the other churches we visited, it was unusually bright, perhaps because it was constructed after the Gothic era. Anyone who knows anything about France has heard of that Corsican general/tyrant Napoleon who eventually elevated himself to the title of emperor of France. 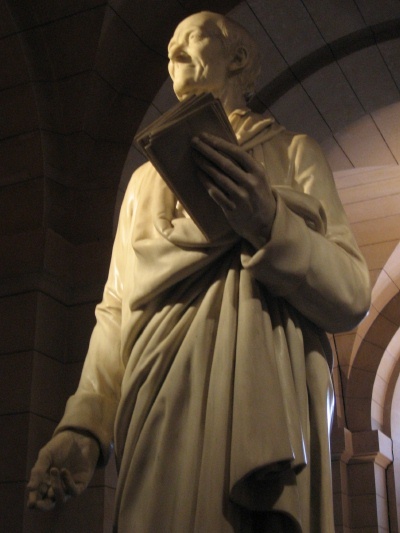 St. Helena apparently was apparently glad to get rid of him after he died, so eventually his remains were returned to France for a proper interment. Next to Invalides and Eglise du Dome is Napoleon’s Tomb. 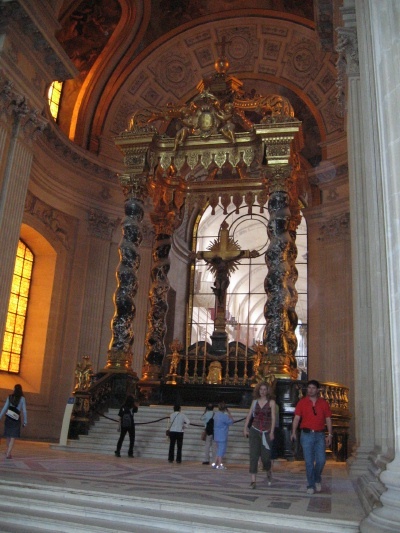 It is probably more accurately described as Napoleon’s casket, as you can see from the picture. 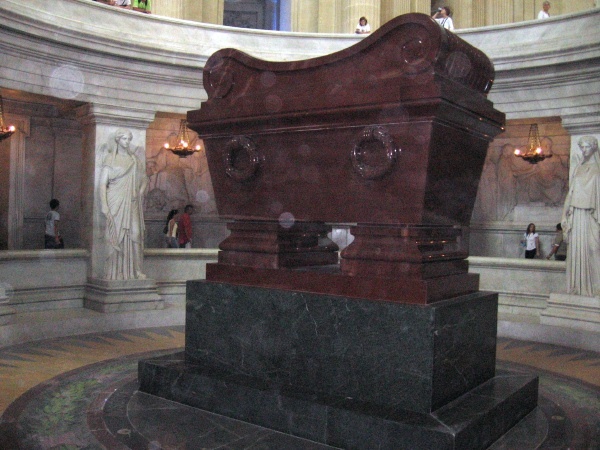 His casket is enclosed within two other caskets, and placed on a large dais, giving the impression that the Jolly Green Giant, rather than the relatively short Napoleon, is entombed there. Napoleon’s Tomb also includes wings containing the bodies of other, lesser-known French military heroes. Across the street is the Rodin Museum. Auguste Rodin’s famous statue, The Thinker, is there, along naturally with a wide selection of his works, including part of his infamous Gates of Hell. When Rodin found a theme that worked, like The Thinker, it showed up in various scales in many of his other works. Since I shamelessly use The Thinker to dress up my own blog, I felt sort of like a lost dog coming home to its master. You would think The Eiffel Tower would have been one of our first destinations. However, we did not get around to touring it until the second half of our trip. Based on our experience, do not try to tour it after a long day on your feet. The lines in the evening though were less daunting than the ones we considered in the afternoon the day before. I did not expect The Eiffel Tower to be as large or as tall as it actually was. It is enormous and very imposing up close. In 1889, when it opened, this 1040-foot high behemoth instantly became one of the wonders of the world. Amazingly, more than a hundred years later, it has lost none of its impressiveness or sense of wonder. If you are not vertically challenged you can walk to the second level of the tower, but to get to the very top requires an elevator ride. Unfortunately, there are queues for tickets, queues to get on the elevator to the first or second level, queues for the elevator from the lower levels to the top (on a different elevator), and queues to get in the elevators to get back down again. You need to allow a couple hours at least to take in this attraction. Even if you are footsore like we were, it is worth the hassle. Our legs felt like lead when we traipsed back to our hotel around 11 PM. Nevertheless, it was neat to be on the tower in the twilight. Once an hour starting at dusk, they set the strobe lights on the tower dancing. They delight both those on the tower and those watching it from afar. Here is a view from the top of the tower. The Arc de Triomphe on Paris’ right bank celebrates the victories of Napoleon’s armies. It remains today the largest arch in the world, yet you can climb to its observation level without too much effort, or take the elevator. While impressive when it was built in the early 19th Century, now it feels overshadowed by The Eiffel Tower, which can easily be seen across the Seine River. Since a traffic circle surrounds it, you need to take an underground walkway in order to get to it. Crossing the street anywhere near the traffic circle is not for the faint of heart. It is a short walk from the Arc to the Champs-Elysees, Paris’ tree lined version of New York’s Fifth Avenue, only nicer, wider and less congested. You can walk the Champs-Elysees all the way to the Louvre and hardly strain yourself. Along the way, there are numerous places to purchase classy and overpriced merchandise, as well as enjoy an expensive meal at an outdoor café. Both Toyota and Honda have showrooms on the boulevard, not really to sell cars so much as to show off what they are working on in the future. Take a look at this short movie clip (18.3 MB) filmed by my daughter to see what the Japanese car wizards are up to. One of the last museums that we went to in Paris was The Pantheon. Yeah, I thought it was in Rome too. I guess France was feeling an inferiority complex so they created their own. This Pantheon fascinated me not so much for the Foucault pendulum in the center or the enormous painting or embroideries on the walls, but for the tombs in the dark crypt beneath the building. Here we found the tomb of Francois-Marie Arouet, otherwise known as Voltaire. Nearby you will find tombs of other French literary idols, such as Victor Hugo and Alexandre Dumas. I was delighted. France is indeed a civilized country. I am aware of no place in America where we immortalize our greatest writers and scientists (including Marie Curie, who inadvertently gave her life learning how to harness radiation). The satirist Voltaire is one of my heroes, so I truly felt in awe being so close to his body. Near his tomb is a large, marble statue of him. Perhaps it was against the rules, but a tourist left a small note on the top of Victor Hugo’s tomb, thanking him and saying his stories were immortal. Indeed they are. My little blog will be a footnote of a footnote in human history, but writers like Voltaire, Hugo and Dumas have truly achieved immortality. I should have felt envy, but instead I felt awe. My next entry will discuss our day trip to Mont St. Michel on the coast of Normandy, as well as give a few final thoughts about France. The downside of France having a monarchy for so many hundreds of years is that its citizens were (literally) royally screwed. You probably read about their French Revolution in the 18th century, when virtually all of France’s nobility met untimely ends. After touring the opulent palaces of Paris, it is hard to shed a tear for the nobility when they at last had their comeuppance. Even after visiting the Conciergerie, the haunting prison in Paris where thousands of people (including Marie Antoinette) were barbarically executed, it was hard to feel sorry for a class so out of touch with their citizenry. The upside of the centuries of royalty is that they left the country with many incredibly opulent estates for future generations to gawk at. Eighteenth century France in all its opulent excess is best viewed at the King’s “summer home” in Versailles, which is on the western outskirts of Paris. Those French Kings were clearly unafraid of living large. 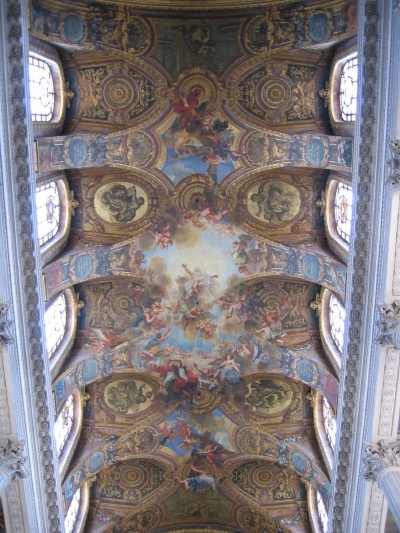 Above, for example, you can see just one the many marvelous ceiling paintings in the Palace of Versailles. There were so many ceilings to dress up. For a French King, just applying a coat of Benjamin Moore would not do. Famous European painters found plenty of steady employment courtesy of the King of France. It must have taken many decades just to paint these ornate ceilings. Of course, it is not just the walls and the ceilings that needed an artist’s touch, but everything in the rooms. Statuary abounds in Versailles, along with marble floors, enormous stone columns, exquisite hand constructed furniture and enough gold plate to fill Fort Knox. The rooms just go on and on and seem endless. The King’s stables alone are bigger than most apartment buildings. His gardens stretched for miles. Naturally, what summer palace would be complete without an inside church that looks more like a cathedral, and an opera house for a few hundred of the King and Queen’s guests? There must have been many top-notch French painters and sculptors though, because Paris is awash in spectacular painting and statuary, as well as Gothic churches. The obvious place to view much of it is in Paris’ enormous museum, The Louvre, which takes up several city blocks. The Louvre is the largest museum in the world. Unless you just want to sail past the exhibits, there is no way to appreciate everything in the Louvre in one day. A proper visit to the Louvre would take a week at least. Someone with a history and art bent could easily spend a month taking it in. There is so much artwork in some rooms that paintings hang above paintings that hang above paintings. If writers are encouraged to write about what they know, then it is obvious that French painters painted what they knew, which was Europe. There likely were not many Encyclopedia Britannicas in those Renaissance and post Renaissance times. It is not surprising then that so many paintings of the time had religious figures in them. Painting Biblical scenes as if they occurred in France and populating the Holy Land full of Anglo Saxons though does become amusing after a while. You have to look hard for someone who looks Semitic among all those paintings. As depicted by the artists of the time, the Holy Land of Biblical times were full of flaxen haired Europeans in 14th century garb. Baby Jesus was apparently overfed and obese, as were many of the women. Speaking of women, as depicted by the artists of the time, they were not very modest. I was amazed by how many women went around with one (or more) perfect breast exposed to the air. Men too were often traipsing around with full genitalia on display. Many artists painted variations of Da Vinci’s famous painting The Last Supper. In these newer versions though, Jesus invited a few more people to the table. You can find paintings of The Last Supper containing many a French nobleman or King breaking bread with Our Lord. For me the glory of French art was not in its paintings, nor its statuaries, nor even in the opulent excess of its palaces. Fittingly, ecclesiastical art is where the art of its age reached its zenith. For a damned secular humanist like me, it was impossible to slip into a basilica, church, chapel or cathedral in Paris and not feel the presence of the sacred. Everything in these churches was meticulously designed to inspire reverence. There is no question about it: no one does mysticism better than the Catholics. What unwashed peasant would not want to convert to Christianity after entering a cathedral like Notre-Dame? 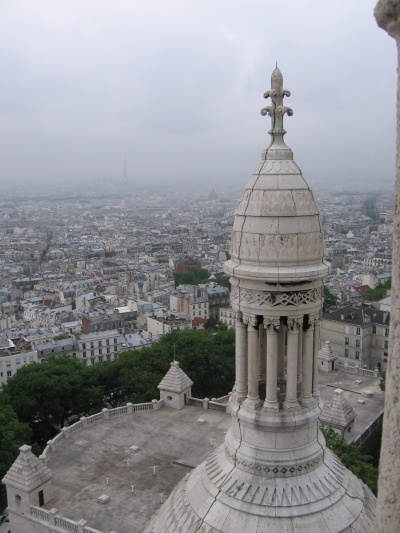 We inspected three churches in Paris. 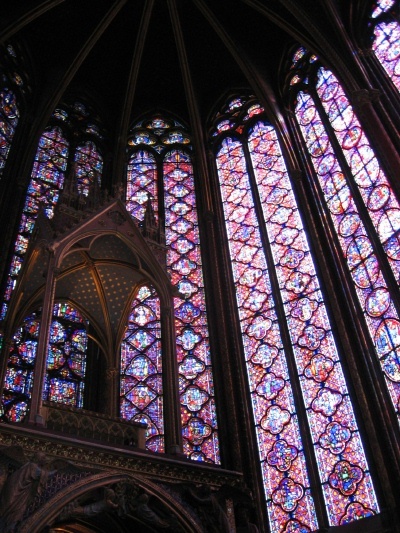 The most jaw dropping of them was a simple chapel: Sainte-Chapelle, with glorious stained glass windows dating to the 11th century. Amazingly, they are still intact today and, as this picture shows, of such magnificence that no contemporary art can come close to matching it. It is ironic that a church of such beauty casts a shadow on the courtyard of that bloody prison, the Conciergerie. A proper visit to Paris requires a trip to the Cathedral of Notre-Dame. This cathedral’s construction began in the 12th Century. For a structure so old, it remains in very good shape. This is thanks, no doubt, to centuries of maintenance. I had heard that Notre-Dame was over-hyped. Thankfully, my sources were incorrect. Sainte-Chapelle is magnificent but relatively simple. 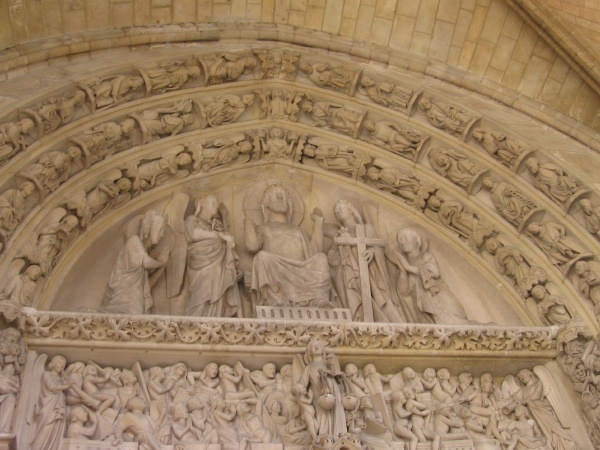 Notre-Dame is enormous but ornate, as the picture of just some of its engraved statuary demonstrates. Despite more than eight centuries of use, the inside of the cathedral remains awe inspiring, holy and reverent. While we were there, a Mass began. You can watch this short movie (4.7 MB). My daughter recorded it from inside Notre-Dame. You can hear the ethereal voice of a mezzo-soprano singing inside the cathedral. More than a week later, it still sends a shiver up my spine. What you can see, but of course cannot smell, is the incense. My daughter, who professes to be Wiccan, exited Notre-Dame as dazzled as I was. “I have never been in such a holy place,” she said in a humbled tone that belied her sixteen years. Each church had rows of votive candles. In each, I spent a few euros to light a votive candle for my mother, who passed away last year. I am sure she would appreciate the thought. I also suspect that she would be amazed that her secular son lit a candle in her name in such holy spots. My wife has some friends in England who came to visit with us for a few days while we were in Paris. 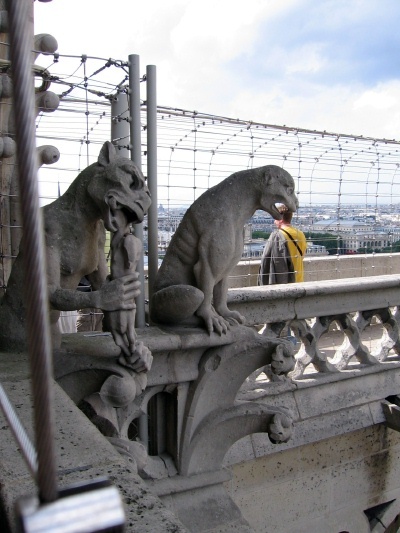 With them, I climbed to the top of Notre-Dame, inspected its belfry but did not find Quasimodo. I took many pictures of its numerous gargoyles. It is amazing how well-preserved most of them remain, in spite of so many centuries of being exposed to the air. We also visited a relatively recent church, the Basilique du Sacre-Couer, which is not too far from the morally dubious Moulin Rouge area on Paris’ right bank. As in Notre-Dame, we ascended into its upper levels via many a winding and vertically challenging staircase. 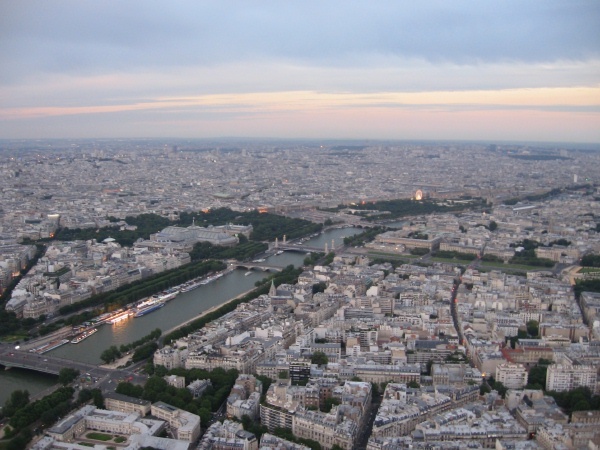 Once near the top, we enjoyed this somewhat occluded view of Paris from its highest point. I will detail more of the museums we visited in my next entry. Take a close look at the photo below. I shot this picture from the balcony of our hotel room. It shows Rue Sophie Germain, an alleyway next to our hotel, which itself is off Avenue Du General Leclerc in the Montparnasse section of Paris. My family and I recently spent eight nights here. 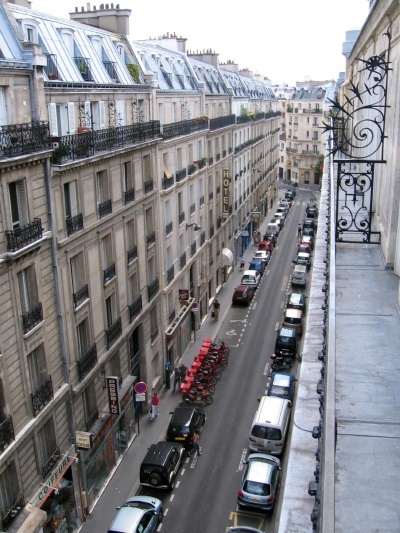 You may have seen pictures of Parisian streets like this one before. It was rather typical of the Paris that we saw, at least inside the city itself. This is the Parisian way of living. The street level contains businesses that serve the neighborhood. People live above the street level in apartments. Each building almost looks like a townhouse, except they tend to be seven stories tall. The houses on this block look old. I do not know exactly how old they are, but I would guess they are one hundred years old. While they certainly look weathered, they are not flimsy. These solid buildings were clearly built to last. 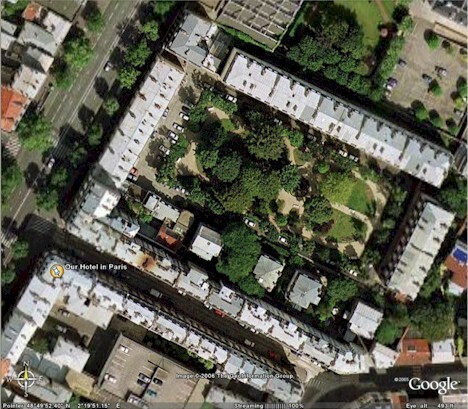 Now, courtesy of Google Earth, here is the same view from the air. Do you notice something different? Notice that the backs of these buildings do not push up against another row on an adjacent block. Inside the outer ring of buildings, there is often (as in this case) a large courtyard full of trees. Here there is both a lovely courtyard and even some houses inside the courtyard. Depending on how apartments are arranged, one apartment may face the street or alleyway, another may face the courtyard. If your apartment faces the street, you would expect it to be noisier. If it faces the courtyard, it is a relatively quiet oasis in the midst of an otherwise busy and bustling city. This may be old fashioned, but this way of living strikes me as very smart. Moreover, it is an excellent way to comfortably fit a large number of people into a relatively small area. Doing so provides both the convenience of being in a major city, yet also provides the ability to escape into a setting that is quieter and more bucolic. You may escape to the courtyard to read a book in the shade of a tree, or to catch some rays on the grass in the sun. Your children might use it to play with other children living in these flats, yet doing so in relative safety and under the watchful eye of many neighbors. If you need to go shopping, there is no need to get into your car and drive for miles to a Safeway or Costco. There is likely a grocer or two within a few hundred feet of your apartment. Yet this is just the start of it. Just wandering down this particular alley we found a number of restaurants, a Pizza Hut carryout, another small hotel and a dry cleaner. Around the corner was an apothecary. Just a block and a half away was a Monoprix, France’s equivalent of a supermarket with a wide selection of foods at reasonable prices. The Monoprix also had a bakery facing the street selling baguettes and wonderful pastries. There were two banks in the same block. To quickly leave the neighborhood you simply had to walk across the street and descend into a convenient subway stop. There is no grass to mow, but you can, like most residents, attend a geranium or other potted plant in your window or on your balcony, or decorate your apartment with other living things. You can spend your time at home at leisure, rather than consumed by the incessant chores of maintaining a house. No wonder I had such a hard time finding a stressed out Frenchman. Here in America we like to think we have mastered the art of good living. From my perspective, the French have mastered it. Almost all of life’s needs are readily available for a short walk. There is no need to get into your car to go out to dinner either. On any block there are bound to be at least several cafes, most of which serve excellent food at reasonable prices. An automobile is truly superfluous. With the limited street parking, almost all of it metered, owning an automobile affords no particular advantage. It is doubtful that even if you had an automobile you could make better time than by taking the subway or bus. I am sure it is not perfect living. Perhaps you hear noisy neighbors above or below you. In eight days in our hotel room though, which was clearly just another converted blockhouse, we never heard our neighbors. We heard plenty of noises from the street, so an apartment facing the street is likely trying to those sensitive to noise. And while the buildings look very solid, they are also old. Although it is generally not needed in these northern latitudes, they probably do not come with central air conditioning. I do not know how Parisian urban living compares with the rest of Europe. I suspect their means of living is fairly unique and offers many significant advantages. It is a form of urban living that we Americans could and probably should emulate. Rather than tear down more forests and put in yet more suburban housing in hard to reach areas far from our jobs, why not put in denser housing designed to last for generations in our more blighted inner city neighborhoods, and build in the conveniences like ready food, restaurants and shopping within a short walk that Parisians take for granted? “Community” is a word that has almost lost its meaning here in America. In my suburban neighborhood, I know a handful of my neighbors by name. Some others I know by site, but not by name. The vast majority of them though will remain complete strangers. We share a neighborhood so we are technically neighbors, but we do not have a real neighborhood. In Paris, your neighbors are likely a lot more in your face. It would be difficult not to get to know your neighbors, and become well acquainted with their quirks and personalities. Each block is a community in the best sense of the word. It is hard for me to believe that such an environment would not foster the community values we say we want to have, but to which we mostly give lip service. As I noted, my father’s retirement community is also a real community. Just as in Paris, he lives in a community where it is impossible not to know your neighbors. You meet with them every night at community dinners and bump into them repeatedly in the hallways. You sing songs with them in front of the piano in the town center. You play bridge or chess with them in the evenings. Perhaps that is why, nearing age 80, he seems so amazingly happy and content. Perhaps Paris’ engineered neighborliness explains why the crime rate in Paris is so low compared to most American cities. You would think that living in such close proximity to each other would breed ill will. Instead, it appears to draw people closer together. These communities are the real deal. There is nothing like traveling to an exotic destination to blow away stereotypes. Perhaps there was a time in the recent past when the majority of Parisian waiters were rude. Perhaps the French really do hate Americans, or at least our government. If so, I was too emotionally unintelligent to detect it. On the other hand, perhaps there are so many foreigners traipsing around Paris that the presence of one more American family was hardly a reason to single us out. No, we found Parisians to be polite, friendly, classy and laid back people. Unlike us Americans, they do not seem to need to pop Valium in order to calm down, because life rarely seems to upset them. If anything, America is far ruder and more singular place than France. It was not that we did not witness exceptions. We ate at one restaurant near our hotel to find a patron going into histrionics when he tried to light up a cigarette. This particular restaurant (with an American like décor) actually had a nonsmoking section. This patron was irate when the server asked him to put out his cigarette. He eventually left the restaurant in disgust. In addition, there were a few eccentrics on their subway system. I am not talking about the occasional busker on the metro playing traditional French tunes on an accordion and then soliciting patrons on the car for spare change. No, I am thinking of an extremely rude rider on the metro who, just because he could get away with it, decided to blow a police whistle at ear piercing volumes every fifteen seconds or so for a half dozen stops. These though were the exceptions, not the rule. In the instance of our whistleblower, his fellow Parisians threw him as many dirty looks as we did. In a city with over two million people, you expect a certain number of oddballs. However, there were far fewer of them than I found wandering the streets of Washington D.C. As with Washington, we did not have to look too far to find homeless Parisians. Unlike our homeless people though, they were respectful. No one seemed too bothered if a homeless person made his home on the street, stacked up a mattress as his bed, and even owned a couple dogs. The homeless people never grubbed us for money. I also felt safe in Paris, even at night. Our tour book and even signs on the Eiffel Tower warned us to beware of pickpockets. I never felt threatened. By American standards, Parisians are amazingly law abiding. Yes, the many motorcycles and motor scooters and their seeming lack of mufflers often annoyed us. Since there are numerous traffic lights in Paris, there are numerous opportunities for vehicles to stop and start. When the lights changed to green the ear piercing groans of motorcycles accelerating offended my sensitive American ears. Oddly, after eight nights in the same hotel room, I had mostly tuned out their noise, even at night. Perhaps it is a survival mechanism, since you cannot escape the noise. What amazed me the most though was that when lights turned red, both cars and motorcycles actually stopped. In the Washington area, the odds are high someone will run a red light. I witnessed very few red light runners during our time there. Despite the noise and the population density, Paris struck me as a laid-back city. In America, we seem to be on personal quests to be the best that we can be. If this means getting a graduate degree or stepping on your colleagues in order to win a promotion, well, that is the price of progress in a society where free enterprise and capitalism has become our de facto religion. Money and status are vitally important to Americans. Parisians struck me as content to live a simpler and more stress free life. I expected Paris to be dirty, but at least in the tourist districts it was not. Their metro system had a certain malodorous stench to it, but it was far cleaner than New York City’s MTA and I never saw rats crawling along the tracks. The subway system itself is amazingly extensive. If it cannot take you where you need to go, a bus will get you there as readily. Unlike Washington’s metro system, where you may wait a long time for a train, in Paris you generally never need to wait more than a few minutes for a train. Moreover, unlike Washington’s metro system, I never saw a train break down. They keep them running reliably. Admittedly the lack of air conditioning on the trains and in the stations is annoying, but it is only in the summer when this becomes a problem. One thing that is true about Parisians and I assume the French in general: they look gorgeous. The women are not all pretty, nor are they necessarily well dressed, but they make the most of their dress and their appearance. You have to look hard to find an obese Parisian. I am ashamed to say that if you did see someone obese, it was almost invariably an American tourist. Perhaps they stay so trim from the walking that is a natural part of their daily life. On the other hand, perhaps since a majority of Parisians appears to be smokers, the nicotine suppresses their appetites. Whatever. Unquestionably, Parisians have a sense of style and good taste that you find only sporadically here in the states. At least in Paris, there was little in the way of a language barrier. Paris is very much an international city. At times English seemed as pervasive as French, but it was also not hard to hear most of the other languages spoken on the continent. Most waiters and shopkeepers, through necessity, know enough English to conduct business. Moreover, I found that I could get by knowing a dozen or so French words then apologizing and speaking in English if necessary. From my dress, Parisians could figure out that I was American, and consequently would speak English to me by default. I quickly learned how to say, “Excuse me”, “Hello”, “Thank you”, “Please” and “Thank you very much” in French. Even when we toured museums and the words were entirely in French, I could usually figure out what was written on the plaques. English and French share a lot of words and many words are similar or are easy to infer. Of course, I could not read a newspaper, but I could read street names, find exits and know how to open doors easily enough. It did help to have my daughter to translate when we needed to express a more complex thought. Nevertheless, my wife and I could have navigated easily in Paris even without her. My complaints are perhaps trifling in the grand scheme of things. They are simply a result of being raised in a different country with different values. I do not mean to imply in my criticisms that there is anything inherently wrong about the way the French life. Indeed, as you will discover, I found much to admire about the French. America has become the country of nonsmokers, so the stench of cigarettes was challenging to my easily offended olfactory glands. When we asked for nonsmoking areas in a restaurant, they generally were not available. To cope, we sat on tables by the street and hoped we were upwind from the smokers. Invariably some smokers near you would light up, the fumes would hit you in the face, and there was little that you could do about it. My wife reports that smoking is down considerably from her first visit thirty years ago. This is good, and I hope that the trend continues. Although I will miss Paris, I will not miss the pervasive smoking. Another nit is the cleanliness of the restrooms in France. Actually, there are no restrooms in France. They are called “toilettes”, which is certainly more descriptive, since there are no chairs or places to “rest” in American restrooms. You generally have to use a restroom in a bus depot to find toilets as nasty as you find in France (and I imagine most of Europe). Another annoyance: in many places, you have to pay for the privilege of using the loo. In fact, it is more likely you will have to pay to use a “toilette” than not. Fortunately, it does not cost an arm and a leg to pee. Forty Eurocents seemed to be the going rate. In some places, attendants made their living directing people to empty stalls and occasionally going around spraying air freshener. On the plus side, it is much easier to find a toilet in Paris than in most American cities, because pay toilets are right there on the side of the streets in many areas. Often there are waiting lines. For a European visiting America, I imagine finding a nation full of free and clean restrooms must seem amazing. Due to its northern climate, air conditioning is largely unavailable in Paris. We found some parts of Charles de Gaulle International Airport air-conditioned. The Louvre was also air conditioned, although the press of people in some popular galleries made them unbearably hot. Otherwise, no places we visited were air-conditioned. Our hotel room has an air conditioner, but it was underpowered and largely useless. Since the temperate never exceeded 85 and it was generally in the 60s at night, this was just an annoyance. After a day of touring, we were usually sweaty and hot when we returned to our room. Only a long cool shower and a fresh set of clothes would make me feel like a human being again. When I consider how much money Americans spend to artificially heat and cool their homes for optimal comfort, and how much this contributes to global warming, I consider that the lack of air conditioning may be a good thing. Incidentally, there were no screens on our hotel window. Fortunately, there were so few flying insects that it did not matter. Apart from the street noise, there was no problem leaving our windows opened. As best I can tell, the most profitable business in Paris during the summertime is bottled water vendor. I did see one public water fountain at the Cathedral of Notre Dame, but otherwise you had to pay from 1.5 to 2 euros for a modest bottle of spring water from a vendor. I would not be surprised if we ended up spending 100 euros in our eight days on bottled water. We did save some money by buying a six-pack at a supermarket. One day I even lugged a six-pack in my backpack as we toured Paris. With the warm weather, it did not even last us the day. Again, I expect that Europeans must be astounded by the free water fountains, generally serving good tasting public water, which is commonly available in the United States. There will be more on our French experience in future entries. One week from now, my family and I will be in Paris. I am not sure what we will be doing there one week from now, but we should be there. Yeah, I know about the Eiffel Tower. In addition, I have heard of the Louvre. Moreover, I will definitely check out the Cathedral at Notre Dame, along with as many cathedrals as I can. (I have this thing for old gothic churches and cathedrals. Unfortunately, my wife and daughter do not.) Aside from hearing that the French have a reputation for hiring snooty waiters and open contempt for those like me who cannot speak French, I might as well be heading to the Moon. It is hard to know how to prepare properly for what will be an alien experience. Still, I am hopeful. Perhaps I have concentrated too much on the negatives, and not on the positives of Paris. Josseline from my covenant group is French, and she assures me that Paris is a charming city that I will fall in love with. That is fine with me. I would like to fall in love. Since I am married, it is better to fall in love with a city than with another woman anyhow. For the eight days or so that we are there, I will do my best to turn off my inner Washingtonian and adapt to Paris time. Aside from the six-hour time change, I will also try to avoid trying to see how many different museums and cathedrals we can take in during a single day. I come from a city where every minute is rigorously metered. Time is money in Washington. Spending an extra half hour at a Parisian café just taking in the ambience sounds wonderful. Unlike my last two vacations where the computer came with us, during this one the computer stays at home. A blogging vacation, at least for me, is an oxymoron. I cannot fully enjoy a vacation if I am regularly streaming my thoughts about it back to the Internet. So Occam’s Razor fans will have to accept my absence from July 5th until at least July 15th. I do hope to bring a notebook (the paper kind) to remember key points. Moreover, I expect that I will regurgitate a lot of this vacation for your amusement or annoyance later in July. Along with my notebook, we will bring our new Canon Powershot digital camera and the 1GB memory cartridge we purchased for it. That is big enough for 500 or more photographs. Perhaps I will risk recording a brief movie with the camera, and posting it to the blog. I have never posted a video on my blog before. I hope getting there and back is half the fun. We saved a few bucks by flying through Iceland, so perhaps we will catch a spectacular view of an Icelandic fiord from our 757. To tell the truth, Iceland sounds more my kind of vacation than France. I am impressed with Mother Nature, and in general, the wilder the country feels the higher the better. I was hoping to have our first European vacation in England. At least there, I can sort of speak the native language. My sister Doris however informs me that Paris is much better. She asserts that not only is it less expensive but the English never developed taste buds. Of course, the French are renowned for their food. Since they seem to live to ripe old ages despite the tobacco, fat, cholesterol and large volumes of wine they consume, maybe I will appreciate the Parisian diet. I am concerned about my daughter though, whose taste is very American and who does not believe in vegetables. I expect she will live on croissants while we are there. While red eye flights are probably the best way to travel east, I cannot say that I look forward to it. There is no sleeping on them, even in business class. Coming back from Hawaii, the best I could do was try to sit quietly for a few hours with my eyes closed. I never came close to falling asleep. Perhaps this is just as well, for the classic way to adjust to jet lag going east is to forget about getting any sleep and stay up until the sun sets in your destination. The only problem with that approach is staying awake until nightfall. I have received mixed advice about using Melatonin as a sleep aid. My experience with sizeable jet lag, as I discussed elsewhere, is that most tactics fail. Since the time shift is six hours, and the body can seem to adjust about three hours a day, I figure it will take two days to get on Parisian time. Thankfully, it is summer time and the days are very long that far north. In addition, I am the morning person of the family anyhow, so it should prove less stressful for me. Why are we going to Paris? Simply because we have a 16 year old daughter with four years of French who is enamored with all things French. She has hopes of studying overseas, and France is her preferred destination. While she has gotten more realistic about her plans (I am not sure how many years of tuition we can afford at American University in Paris with a tuition rate of 30,000 euros a year), seeing France in person will at least give her a reality check. If truth were told, I am hoping she returns not too enamored. Quebec is a lot closer and likely less expensive too. So I have been thumbing through our Frommer’s book on Paris trying to get prepared. While I am sure I will stand out as an American tourist regardless, I am considering their advice to blend in by perhaps being dressier. Perhaps I should avoid the blue jeans and sneakers and wear pants and shoes instead. The guide warns us to watch for pickpockets and to try to not get too upset by all the prostitutes. In Europe, prostitution just does not have the stigma it has here in the states. In truth, I need a vacation. Paris will more than do. I need to get away from the office, because it is hard not to carry the office with me on vacation. The very day we leave, I have to brief our Associated Director on a project on which I am involved. Fortunately, we have an evening flight. I make my living as an information technology web site manager. As such, half of my brain is always focused one to six months in the future. It is a challenge to get all my ducks lined up in a row so I can enjoy my vacation. I am hoping with a complete change of scenery that I really can forget about my job and all the responsibility that comes with it. So okay Paris. I will let down my guard. I am ready to fall in love with you. I will be easy. What am I to make of this news article? The French were voted the world’s most unfriendly nation by a landslide in a British poll published on Saturday. They were also voted the most boring and most ungenerous. A decisive 46% of the 6,000 people surveyed by travelers’ website Where Are You Now said the French were the most unfriendly nation people on the planet, British newspapers reported. Until now, I thought I liked the French. Of course, I have not yet actually been to France to verify these opinions. (That will change this summer.) Still, who could object to all those lovely French wines? Their renown French culinary skills? However, their food is just one of the reasons I should feel a kinship with the French. To use a French expression, they seem to get more joie de vie than the rest of the world combined. They get to take extended summer vacations. Most of the country goes on holiday after Bastille Day. Citizens are required to work no more than 35 hours a week. They have nationalized health insurance. You need a special exemption to work on Sundays. Retirement starts at age 60. Labor unions are not just a good idea; they are required. It is such a good system for French citizens (or from what I read native French citizens; immigrants tend to get a raw deal) that it is no wonder that young adults in France took to the streets recently to protest. A proposed law would have taken away certain of their rights, including the right to a secure job. The French get it: life is more than slaving away for an employer who can cut you off at any moment. Life should be more relaxed and less burdensome. Gosh, in France, it is even okay to have extramarital affairs. Everyone understands. Love and marriage do not necessarily serve similar purposes. No wonder my daughter wants to live in France. Yes, I had rumors that French waiters were a bit on the rude side. Perhaps that is the problem: tourists are more likely to encounter waiters than perhaps any other class of French citizen. Likely, passing a class on customer service was not required for their position. Since French waiters have a job for life, there seems to be little reason to be courteous. Since rude waiters in America are not likely to get much of a tip, I have to assume that in France the tips are included in the cost of the meal. Whatever. Now I am preparing for a rude French experience. I have been warned. I will not be in Kansas anymore. I can expect brazen prostitutes on the subways and outside the hotels. I will need to be mindful of the professional pickpockets. I shall be tactful. I shall not retort to the insults I receive by suggesting that the French should take a bath more than once a week. I shall expect the stores to close early and for many businesses to take a long lunch hour. I shall studious look both ways several times before crossing the street. As for Paris itself, although the word I keep hearing repeatedly again from those who have been there is “filthy”, I shall be mindful of its beautiful aspects. I am glad we have our daughter to translate. Perhaps if they are cursing at me I will not be able to tell. Yes, I am sure I am a bad American, even though I did not vote for George Bush. (I need to get the t-shirt that says this, written in French, of course.) They will think that I expect everyone to speak English. Sorry, no, I will not take the time to learn French if I will only be there for nine days. You know, it is hard for me to feel offended where I live if someone is not speaking English. Heck, it feels like half the people I meet in everyday commerce are speaking in some other language, usually Spanish. It has gotten to the point where a number of the stores I go into have job applications in both English and Spanish. The managers tend to know Spanish; otherwise, they would not be able to talk with their own employees. It sure would be convenient if all the immigrants in my community spoke fluent English, but many of them cannot get out a simple sentence. Yet I shall not start cursing at them for their inability to speak my language. So I imagine the French are a bit of a dichotomy. You will doubtless hear more about the reality of France after I return. Considering how much money it will cost us just to have a vacation in France (close to $3000 just for three airline tickets), and how dramatically I have now reduced my expectations of the French, I do hope all those tourists are wrong.